I imagine the first two years that you have a child Christmas celebrations are far more special for the parents than they are for the kid who doesn’t quite know what to make of the fact that there’s suddenly a tree growing out of the living room rug that’s covered in lights and other sparkly things you’re not allowed to touch. After all a one or two year old hasn’t been around long enough to have heard the buzz about all the swag you can get on the twenty-fifth day of every December so the day itself – and the gifts that go with it – probably aren’t all that big of a deal for the one receiving them. So why all the fuss? What’s the point of spending a bundle on a kid that can’t read a calendar to know what holiday it is let alone write a Christmas list to plead for what they want? If they woke up Christmas morning at that age and there was no tree, no stocking, no presents… no ribbons, no tags, no packages, boxes or bags… they wouldn’t suspect their house was visited by the Grinch, they’d simply eat whatever mush being spoon fed them and treat it like any other day. But parents wouldn’t go for that. They want to feel like they’re good parents by spoiling their offspring with unnecessary purchases and then show off their reckless spending by taking loads of pictures to commemorate the event. So Christmas – though it approaches without any awareness by the child – is still treated as a big deal the first two years of their young lives. Year Three is another story entirely though. At three years old the kid is walking, talking and fully aware of their surroundings and so that third Christmas is the one where it all starts to come together – anticipation, expectation and (hopefully) fulfillment. On December 25th 1949 rock ‘n’ roll music would celebrate its third Christmas which is why this year we’re finally getting a giant pile of records under our tree to commemorate the holiday. Back in late 1947 during rock’s infancy, still drooling and cooing in its crib, Sonny Thompson was like many other rock acts in that he was working over the holidays. Anticipating the recording ban set to strike come New Year’s Day most record companies were cutting tracks around the clock in December to have enough material to get them through a long work stoppage. Sonny was just a meager employee so he wasn’t yet invited to any Christmas parties with the big wigs, he hadn’t even had any records of his own released yet and was merely backing a series of unimpressive vocalists in the studio over the last few months for Miracle Records where he was employed as a session pianist. Maybe they paid him a few bucks to shop for presents for somebody else but you can bet it wasn’t much. 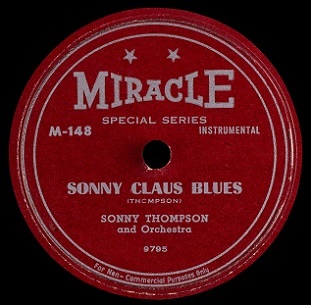 But twelve months later Sonny Thompson was invited to EVERY Christmas party after a year in which the handful of songs he was allowed to record during those long hours in the studio in the waning days of 1947 wound up becoming some of the biggest hits of 1948, with his debut, Long Gone being the biggest chart hit of the year in not just rock but all of black music, and he followed that up with a second chart topper in Late Freight. Not bad for an artist perceived as afterthought headed into the year. But now as Christmas approaches in 1949 Thompson might only be lucky enough to get a Christmas card… maybe it’ll even be delivered C.O.D. The reason for this turnabout is because he hasn’t exactly had the same success with his releases this year when everybody was now expecting him to continue his hot streak and perhaps even build upon it. Instead he left coal in everybody’s stocking. Not that it was his fault exactly. Miracle Records hadn’t bothered bringing their star back into the studio during the strike of ’48, even as their rivals were busy cutting illicit sessions to be able to keep up with the demands of a rapidly expanding market. Maybe that can be excused somewhat since Thompson’s two big hits were still on the best sellers lists through the end of the year, but when the strike was over in early December they still made no effort to get Sonny back in front of a microphone, letting another five months pass until they had no more material left in the vaults after releasing his final two sides in January which had been cut back in ’47 (and getting minor hits out of them, despite their inferior quality to his chart toppers) which prompted them back into action and finally getting some more records made. Momentum is a hard thing to hold onto in normal circumstances and that year and a half delay was anything but normal. It seemed that perhaps Sonny Thompson’s star which had burned so bright just a year earlier was already extinguished. 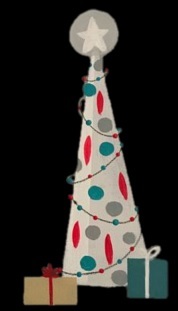 But then again if it’s a star you want, what better place to look than on top of a Christmas tree? The first thing you’re bound to notice about the cleverly titled Sonny Claus Blues is that the many who made a name for himself churning out instrumentals is now singing. And singing fairly well at that. Whether this was done as a career move to branch out and increase his options going forward or whether it was more of a decision made due to the unique circumstances of issuing a Christmas record isn’t known. It might’ve been a little of both truthfully, one that came about due to the need for holiday material but which Thompson also realized could have long term benefits should it be accepted by audiences, giving him a different avenue to pursue in the future. Let’s face it, the fact is if you do want to release Christmas songs you basically have two choices: Do a version of an established song which allows you to cut it as an instrumental if you want, since the melody will be familiar enough to audiences to recognize (see Freddie Mitchell with Jingle Bell Boogie for just such an example), or you could write an original Christmas song provided it has lyrics to let listeners know that it IS a Christmas song. In other words, a new Christmas instrumental might be a tough sell. There’s only so many sleigh bells you can put on a track before it causes you to lose your mind – or leads to an inexplicable craving for climbing to the rooftop and eating carrots with flying reindeer stopping by for a nocturnal visit on December 24th. So considering his past output was made up entirely of instrumentals it is a little surprising that Thompson didn’t simply chose to lay down a version of Silver Bells or Winter Wonderland, something that might lend itself to the type of medium paced piano/guitar/sax shuffle that he was comfortable with. Who knows, maybe Miracle Records didn’t think a widely known song would sell, as rock audiences might not be up for hearing the same old titles done in a different fashion. It could be that Thompson simply knew the value of a writing credit, or if that’s showing a little too much faith to have even during the holidays that a record company would give him writing royalties, then he surely knew that something original would stand out more in the public’s mind if nothing else. Which means we have a lot more components to analyze that usual with Thompson, not just his singing but his lyrical ability and whether that in any way changes his musical instincts we’ve come to know pretty well over the past two years. Since we’ve already stated that Sonny handles the vocals okay, let’s start there. His voice itself average at best, maybe not even quite that good if compared to other professional singers rather than just random people working in a hardware store or the bakery, but his ability as a musician and songwriter ensures that he’s giving himself a platform to succeed in limited terms. For starters he’s crafted Sonny Claus Blues in a way that minimizes his chances to screw it up by sticking to the range and tempo he’s comfortable with. While he suffers from a common amateur mistake of relying on his head rather than chest to project his voice, meaning he’s lacking a resonant tone, at least he sounds like he’s got whatever nervousness he might’ve been feeling well under control and he remains in key and doesn’t rush his vocals or run of breath before the end of the line. Since Sonny’s voice doesn’t make its entrance until nearly a minute has passed and he wraps up the singing just past the two minute mark that means he’s only in the spotlight for a third of the total playing time, not long enough to find fault with his modest technique. Besides he’s not being forced to carry the record with his dulcet tones, but rather he’s merely providing the necessary component for conveying the Christmas theme. As for what he’s singing when he opens his mouth, here too we see the lyrics are designed to just be serviceable, framing the story around Christmas without it actually having much to do with the holiday… at least in the terms we’ve come to expect listening to Bing Crosby croon about it all these years. Sonny Claus Blues is a masculine boast, pure and simple. He kicks it off by telling us his girlfriend has just bought him him a Christmas tree and by the sound of it he’s going to be pulling some shapely gifts out of those Christmas stockings before long. I’m not quite sure how experienced a lover he is though because he seems a little too anxious to unwrap his presents, kind of like an eight year old who wakes the family up at 5 A.M. on Christmas morning in a mad dash for the pile of gifts waiting for him. Sonny’s eagerness apparently doesn’t seem to bother his girl however and for all we know maybe she too has just discovered the various activities that can take place under the mistletoe as well. 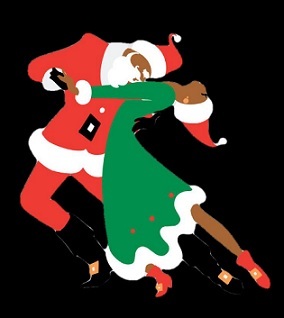 It never delves into to any particulars and other than one more mention of that tree there’s no more references to the holiday itself, but that’s not what most Sonny Thompson fans came for anyway. They’re here for the music and coming off the decidedly underwhelming Dreaming Again and Backyard Affair pairing from earlier this fall, we’re happy to report that Thompson has at least rebounded from that let down. His work on the piano features a spry right hand and a solid left that sets a nice scene to start with. There’s absolutely no hint of the time of year it’s supposed to reflect in its playing, but that’s a minor issue because the arrangement shores up the deficiencies he’s increasingly faced the last couple times around by giving the horns a tight riff and a much gutsier sax solo to get things cooking. When Thompson starts chirping away the horns are the ones keeping the steady rhythmic feel alive, biding time before Sonny closes his mouth and gets his hands moving on the keys in earnest again. He’s hardly going for broke on it but he mixes things up, alternating his approach at different times, making sure to remain percussive enough with his playing to get your shoulders moving until the horns return for the close. You won’t really remember any of it after your second eggnog, but you also won’t mind hearing Sonny Claus Blues if it’s playing before you down that first spiked drink at the Christmas party. With the rash of rock Christmas songs being released down the home stretch of 1949 maybe the smart thing to do is to sort of treat them like gifts when we’re trying to place scores on them and remember that not all presents you receive are things you had at the top of your Christmas list. But that doesn’t mean they’re stuff you’re hoping to get the receipt for so you’ll have an easier time taking them back the next week either. A lot of gifts are merely nice gestures on somebody’s part, some inexpensive trinket meant to show that somebody was thinking of you. It’s the thought that counts, isn’t that what they say? Maybe that doesn’t mean you’ll be taking out Sonny Claus Blues to show your friends when they ask what you got under the tree this year, or that you’ll necessarily be cuing the record up at next year’s Christmas party to set a festive mood, but if you stumble across it every now and then on a holiday playlist it might bring a smile to your face. Not so much for the quality of the gift itself maybe, but rather the fact that somebody we genuinely liked and were once much closer to was nice enough to remember us even though we’ve drifted apart a little over the past year and that they went to the trouble of trying to find something we might appreciate. When that happens we open the present with a smile, thank them for their thoughtfulness and make a mental note to keep them on our Christmas card list… at least for another year. Leave a reply on "Sonny Thompson: “Sonny Claus Blues”"